Today, the metal industry is considered to be one of the most competitive and profitable industries. But, it is constantly changing at a rapid rate. Different alloys are being discovered to create different properties that will help enhance as well as reducing other properties. However, often times when one property is enhanced, another critical quality is weakened. This trade of in quality poses a particular issue in the steel and steel alloy market. This is what has caused researchers to develop a new metallic material with ideal features that aid in reducing the excess usage of resources. A new metallic material was developed by researchers at Max-Planck-Institute für Eisenforschung in Düsseldorf. Its remarkable capability to maintain strength and ductility has the potential to completely transform the steel and steel alloy industry. This ductile metallic material can be adapted for designs with thinner metallic sheets while maintaining its strength and shape. A possible application would be the production of car bodies. With the use of this material as a car body, it can reduce the damages caused in accidents. The problem with the different steel used today due to the use of iron and other fragments such as vanadium, carbon, or chrome, which are ductile in nature, increase its ductility but reduce strength. These materials tend to break and crack under applied force or pressure. Researchers and metallurgist started research into finding an ideal combination of metals to design the “perfect metal”. This process began by examining alloys that have had prior extensive testing, but have been dubbed too fragile for many applications. However, recently they have increased their capabilities and began creating alloys with five or more components. This was able to increase their atomic disorder, the measure of disorder is entropy. High-entropy materials have a high strength. This is because atoms of the elements are spread out in random order making it difficult for atoms to travel and dislocate. The scientists combined the ductility of steel with the high entropy alloy allowing it to have two existing structures. 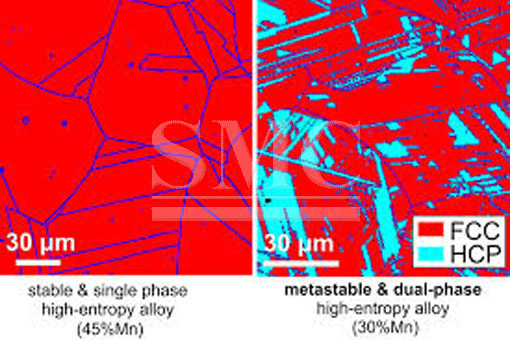 They found an alloy composed of 50% iron, 30% manganese, 10% cobalt, and 10% chrome possessed the desired two structure quality. Scientists are now trying to enhance the alloys micro-structure making it even stronger and ductile. This scientific breakthrough has the potential to transform the steel industry as we know it. Not only will it benefit producers along with those in the industry, but the environment and raw materials sustainability’s as well.